We've officially launched Dreamers in Reality!!!! 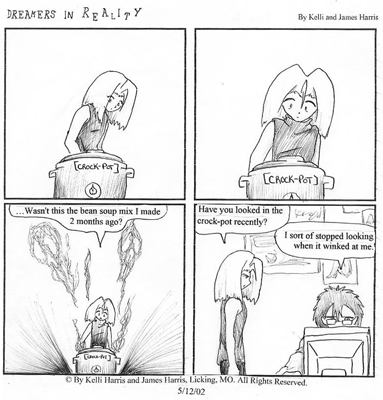 Dreamers in Reality was a comic my older brother, James and I created over 15 years ago. It's a lighthearted comic about a brother and sister who have very different paths to cope with their realities. It includes an imported anime girl in a bunny outfit, an imaginary friend, food that spoiled in the fridge to the point that it became a living creature, a crock-pot turned evil and so many more unique characters! Dreamers in Reality was birthed from us dealing with a tragic incident, and laughter is how we dealt with it. We kept the comic going (despite an internet presence! This was all newspapers and newsletters back then kiddos!) until about 2003, so for 2 years! As we grew up, we slowly drifted ways and Dreamers in Reality fell in the cracks. But now we're back, debuting proudly on the Internet! First, we're going to remaster some of the best comics! For the few that may remember our original issues... You may remember how it looked. Inked with a basic ballpoint pen, roughed, the text was typed in Comic Sans, printed, cut and glued carefully onto the comic. It looked a hot mess. Beautiful, right? It certainly taught us a lot of lessons, that's for sure. Once we are finished remastering some of the best issues, then we will proudly debut: Dreamers in Reality; 15 Years Later! Yes, we'll create a few comics about James and Tachi, 15 years from way back when we humbly started this comic. Will Mochi still be around? Will Tamacho play a role at all? Will James have dominated the world? Will Tachi have a job? Whatever became of Dlom? Of the Crock-Pot?! We're pretty excited to retell the old stories and create new ones. I hope you are too! Check out our Dreamers in Reality comics here! I AM ON PATREON! Really exciting stuff, amirite?! Patreon is a site for creative people to be supported by their fans. Supporters, or Patrons, can support their favourite artists and receieve some really cool rewards in return! I'm starting off with 3 tiers: Ink ($1), Colour ($5), and Vinyl ($10). I really want to build a strong community with my fans and really get some valuable feedback from them! So, check it out! I've officially launched my newest project: Monthly Misadventures! It's a quirky webcomic about my personified period named Peri. It's updated twice in a single week per month! Check out some more information here but I hope you'll enjoy it! All rights reserved by Kelli McGee. Please do not steal, borrow, copy or manipulate any of my work.